Kosherfest, the world's largest kosher trade show, features more than 325 exhibitors. SECAUCUS, N.J. (JTA) — At Kosherfest, the world's largest kosher trade show, Yiddish and Hebrew is heard alongside English. Some 6,000 kosher-food insiders packed the massive hall, chatting, networking and tasting samples. The crowd skews male and Orthodox — in fact, it may be one of the only events where the men's bathroom has a longer line than the women's one. The annual two-day expo being held this week at the Meadowlands Exposition Center here is a food mecca for those who observe Jewish dietary laws. Among the more than 325 exhibitors are vendors touting everything from the kosher staples — beef salami, latkes and Israeli wines — to new and unexpected foods, such as a line of Korean products. Manischewitz is launching a line of matzah-themed treats that will make Passover a bit more fun for kids — and maybe adults, too. Prior to Passover in April, the company will introduce two do-it-yourself food "kits": matzah s'mores and matzah pizza. "This year at Manischewitz, it's all about kids," the company's president and CEO, David Sugarman, told JTA. "We sat around and thought about what fun items can we come up with for Passover that would get kids engaged in Passover." The s'mores kit, which won Kosherfest's award for best new kosher-for-Passover product, comes with all the necessary ingredients — mini matzahs, chocolate and marshmallows. The pizza kit, however, contains just triangle-shaped matzah and sauce; moms and dads must provide the cheese and any other toppings. "We think there's going to be a lot of adults with kids that are going to be sneaking these items while their kids are off at school," Sugarman said. Dyna Sea is a pro in the world of imitation shellfish — "surimi," as it is called in Japanese — having been in business for nearly 20 years. The kosher food company even has Japanese consumers buying its products, according to owner Daniel Berlin. These imitation crab cakes, which won Kosherfest's best new product award for frozen foods, are made with imported Alaskan pollock. Berlin said they taste very close to the real deal. "It has such a beautiful, rich, seafood flavor and a texture, a mouthfeel, that really simulates the real thing," he said. And though this reporter has never had a real crab cake, she couldn't help but go in for a second faux one. Kosher-keeping chocoholics know the pain of overly sweet parve chocolate spreads that lack the richness of Nutella — and never quite hit the spot. But this new Italian-produced spread -- tapped the best new product at Kosherfest -- is a game changer. 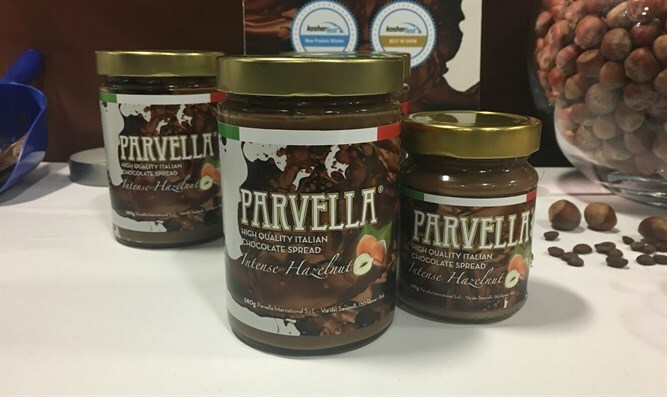 Parvella CEO Gabriele Zarrugh worked for two years to develop the spread, saying he was motivated by the desire to make a delicious kosher product that was accessible to those with dietary restrictions. Parvella is milk, dairy, egg, peanut and palm-oil free. Kosherfest deemed Highland Pop the best new savory snack. Cohen's inventive varieties accurately evoke their namesakes: The birthday cake flavor is topped with colorful sprinkles; here's a kick of cinnamon on the crispy exterior of the cinnamon churro kettle flavor. "It's my passion; coming up with a new flavor makes me feel so good," she told JTA. "This [churro kettle] is my favorite one right now, although next week I'll probably have a different flavor that I like." The Marzipan shop in Jerusalem's Mahane Yehuda market has been for decades nearly as much of a tourist destination as the Western Wall. Once you're in the shuk, the bakery isn't hard to locate. The rugelach's sweet, chocolatey scent wafts its way through the market, enticing visitors to pay a visit and buy a pastry — or maybe 10. "[T]hey got so addicted to this particular rugelach that is considered the best in the world," Milton Weinstock said.